Seven years ago you could have told those close to Rhamat Alhassan that she would be one of the best college volleyball players and very little would have believed you. That’s because the Glenarden, Maryland native did not pick up volleyball until her sophomore year in high school. In fact, she was a basketball player since the seventh grade and only picked up volleyball to take pressure off of basketball. Now she’s a three-time AVCA All-American, the 2017 SEC Player of the year and one of the best players the University of Florida volleyball team has seen. For many years, Rhamat was a basketball player. Then in 10th grade, she picked up volleyball simply because she wanted something new to do. At first, she claims she wasn’t very good at it. However, the more she played, the more she enjoyed the sport more and soon after she fell in love with it. In fact, she forewent her potential basketball career to pursue one in volleyball instead. While many schools were looking at her for their basketball programs, Rhamat recalls that Florida saw her playing volleyball and was interested in her. 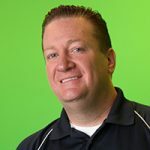 Associate Head Coach Dave Boos was the first person to see her play, and in her words “it was terrible.” But Rhamat joined club teams and improved her game. When recruiting time rolled along it was a no-brainer, Coach Mary Wise and the Florida Gators wanted Rhamat Alhassan. 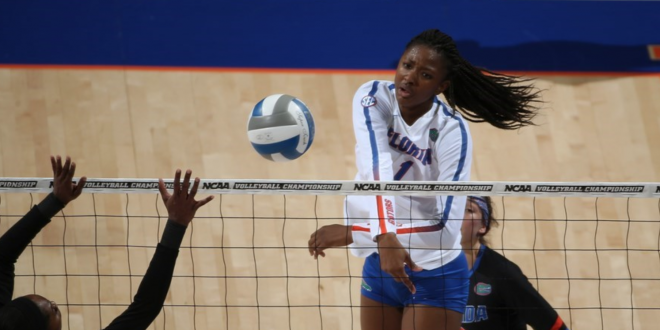 Interestingly, what drove Alhassan to the University of Florida was not just the volleyball program. 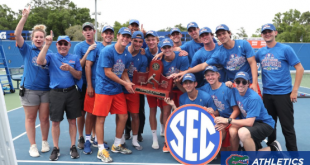 As a close friend and teammate of former Gator Alex Holston, Rhamat was already somewhat aware of the team’s atmosphere. Aside from the coaching staff and the program, Rhamat chose UF for two reasons: location and her major. Rhamat fell in love with the warm environment, a stark difference from her previous life in Maryland. She also chose Florida because of the College of Journalism and Communications. As a telecommunications major, having a top-notch education was just as important to her. As a 6’4 middle blocker, Rhamat takes pride in the physicality she brings to the game. Her height and ability to jump so high have always been a driving force in her style of play. But the other factor that makes Rhamat an extraordinary player is her volleyball IQ. Teammate and fellow senior, Shainah Joseph, says that this combination of physicality and intelligence makes Rhamat so unique. It’s hard to find someone who can cover both parts of being a pure athlete and understanding the game at a higher level than anyone else on the court. Rhamat is a true competitor. Joseph claims she has a grittiness in her game that shows how willing she is to fight for every play, both offense, and defense. While Rhamat does enjoy finishing off a play and notching a kill, it’s defense that she enjoys more. She takes a lot of pride in being able to jump higher than the other team and deny them with a block. Part of what makes Rhamat such a unique player is her mentality. Everything Rhamat does is with the team’s best intentions in mind. 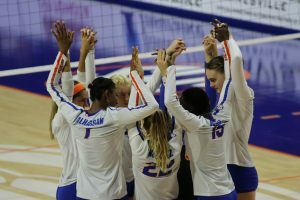 There is no selfishness when it comes to the Florida volleyball team, and everyone plays for each other and the coaches. It can be seen simply through her mindset. Rhamat does not care about the individual accolades. She does enjoy holding UF records and hopes they aren’t broken anytime soon, but she credits all her success to her teammates. As a middle blocker, she acknowledges that her personal achievements would not exist without her teammates setting and passing her the ball. This selfless mindset is also what makes Rhamat a leader on this team. In fact, she has been a leader since her sophomore year. She leads by example; if she’s going to tell someone how to position themselves better, you better believe she will follow her own suggestions. Having such an important role on this team doesn’t really pressure Rhamat though. That is because she’s always enjoying what she’s doing and playing with her teammates. Even though only 6 players are on the court at a time, the entire team plays a role in a game, and when she’s on the bench, Rhamat cheers her teammates on. Rhamat carries her towering on-court presence off the court as well. She is a leader to many of the younger players on the team and enjoys helping them out in any way she can. But her teammates also describe her as someone you can always count on no matter what you need. A testament to her character, Sophomore Rachael Kramer says what she loves most about Rhamat is her personality. Shainah Joseph jokes that the team calls her the grandma of the team, because of her serious yet enjoyable personality. She cares enough to help every player regardless of their position. 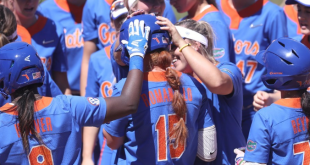 Kramer even acknowledges Rhamat as a sister figure, who has helped her develop her game throughout her first two seasons as a Gator. And Rhamat loves that role; she enjoys watching Kramer on the sidelines finish off a play with a kill or a block. The fact that after this year her collegiate volleyball career will come to an end is still a surreal feeling to Rhamat. She doesn’t focus on what will happen in the future and instead takes a day by day approach. She comes into the gym, puts in her rotations and practices and then turns her mind to the next day. However, the Florida volleyball team has never won the National Championship. 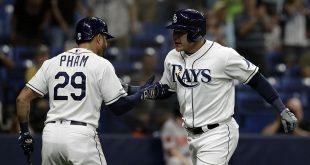 They’ve been close on several occasions, most notably in 20o3 when the team came short of the trophy to Southern California. Since that 2003 run, the Gators have failed to reach the Final Four. Rhamat is hoping to change that this year. Reaching the Final Four for the first time since 2003 is just a step in Florida’s ultimate goal this season. 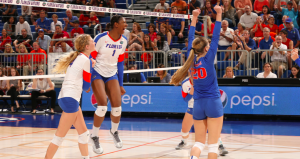 After a 25-1 regular season finish, Rhamat the Gators have their eye on a bigger prize – the first National Championship in Florida volleyball history. The team held on to the disappointing second-round exit to FSU in the NCAA Tournament last season. They felt that pain and turned it into a drive to achieve better and make sure that if they ever do lose it’s not because they handed the game to the other team. Already, the team has surpassed last year’s tournament run. 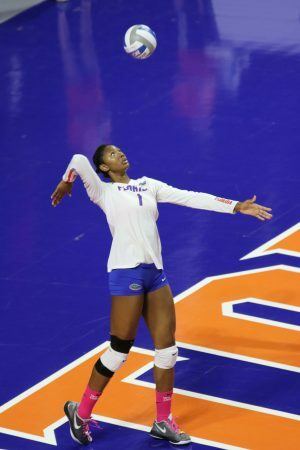 As a senior, Rhamat has much to play for, knowing that any night could be her last in a Gator uniform. But she has confidence in their ability to be a Final Four team. Everyone plays for each other and for the coaches. 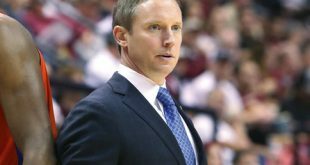 Rhamat owes a lot to Coach Wise, and there is an underlying sense of needing to finally win a National Championship for a Coach who has done a lot for the Florida program and NCAA women’s volleyball. 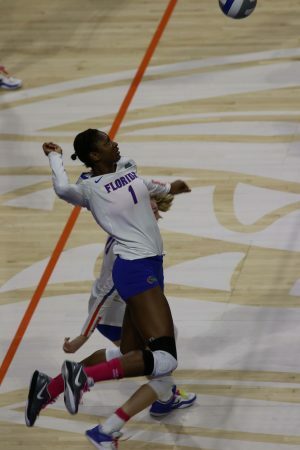 In the immediate future, Rhamat may be playing her last game for the Gators here on out. No. 2 Florida takes on No. 15 UCLA in the ExacTech Arena at the Stephen C. O’Connell Center this Friday at 4 pm. Should the Gators win, she will play to extend her college career on Saturday versus the winner of the No. 7 Minnesota vs. No. 10 Southern California matchup. After her collegiate career comes to an end, Rhamat is looking to go pro and play overseas. While she is unsure of where to go exactly (there is no competitive professional league in the U.S.), Rhamat still has National Team aspirations in her sight. The ultimate goal after Florida is to make the 2020 Olympic Roster and compete in Tokyo. She already has experience with the team, having played at the Pan-American Games in the past two summers. Further into her future, after her volleyball comes to a complete end, Rhamat is hoping to pursue a career in the production field. As a telecommunications major, she enjoys video production and could see a career in down that path in her future. 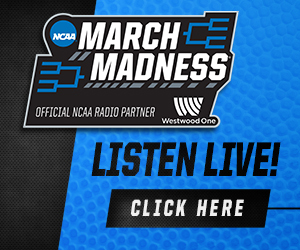 For now, though, the focus is on Friday’s matchup with UCLA, moving on to the Elite Eight and then hopefully a Final Four appearance. 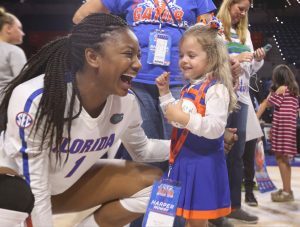 It’s win or the end for Rhamat, and the last chance for her to help bring the National Championship glory to Coach Mary Wise and the Florida Gators. This team is special, and under Rhamat’s leadership, they are hoping to do just that.